Sometimes there’s a silver lining. Okay, enough cliches. I posted a few weeks ago about Angelina’s depression. We’ll just say that things are status quo, but that’s to be expected. Anti-depressants (SSRIs) take about 4-6 weeks to become full effective so I am not expecting much at this point (2 1/2 weeks in). She has still been withdrawn and moody, still doesn’t want to talk about much of anything and especially not diabetes. We changed the schedule with her therapist from once a week, to every other week because it seemed for the past couple of months that every other week they would spend the entire session with Angelina curled up in a chair not speaking a word, and mostly not even acknowledging that her therapist was in the room, let alone trying to speak with her. There was speculation on my part that the timing of this may be hormonal, so we agreed to space out sessions a bit. This week was her first session in two weeks and she seemed fine on the way to the office, but 10 minutes into the session her therapist came out to the waiting room looking for me because Angelina was not speaking to her. After a bit of probing on my part Angelina started engaging more and we discussed why she wasn’t participating. Her feelings were that therapy wasn’t helping her, so she chose not to participate. By the end of the session she had decided that she no longer wants to see her current therapist and would like to see someone else who might understand her interests better, so sometime in the next month (pending scheduling availability) we will be transitioning her to someone new. She expressed that she liked her current therapist, but there has been this underlying current in her statements about therapy that she feels like her therapist doesn’t understand her and she isn’t inclined to explain herself. Which I totally understand, as frustrating as it may be for all of us who aren’t mind readers. I think that rather than risk hurting the feelings of her therapist (which, awww) by telling her as much, she chose instead to just stop talking in therapy. I am okay with this choice. First, because it’s Angelina’s choice. It’s her counseling, her mind, her emotions and feelings and I know it’s not going to be beneficial if she’s not willing to be counseled. Second, because I myself have struggled through the years truly opening up and being honest with therapists who I didn’t feel really understood me or my motivations, or who I just didn’t connect with. I also am a firm believer that some therapists are excellent at helping with certain aspects of a person’s journey, but just don’t connect with other issues. I recently just stopped seeing the therapist I had been with for the past three years (through mutual agreement) because while I am not completely “healed”, we both felt that she had helped me with all that she could help me with, or at least all that I would allow her to help me with. I learned a great many things from her and about myself in those three years and have walked away with an arsenal of coping skills and the most steady mental health of my adult life so far. But, it was time to move on. My biggest issues lately has been stress management and anxiety. My therapist’s approach to stress management involved a lot of new-agey methods that I do not enjoy and seemed to cause me more stress and anxiety, rather than less. What works for some does not work for all. With all of that said, back to the point! Don’t mind me. I’ll just hang out here all night. You don’t need to sleep anyway. Diabetes has been absolutely crazy the past two weeks. We went from a week of stubborn highs, perforated with drastic lows that would shoot back up with a small amount of carbs. Then this past week she was experiencing stubborn nightly lows. On Tuesday her blood sugar did not go over 80 for nearly 6 hours. During that time she was sleeping and I carbed her up with over 100g of juice and honey. Fortunately the lows were not drastically low, but even a level of 60 for several hours can have a great impact on brain function and increase risk of seizures. She ping-ponged between 60-80 between 9p-3am and then finally, finally hit 120 and steadied there for the remainder of the night. The only night this entire week that she wasn’t low was because we went to an all-you-can-eat Mongolian BBQ restaurant and I purposely under-bolused her for noodles because I had a 504 meeting Friday morning and I needed to sleep. She woke up at 197 on Friday, which is not great, but not so terrible either and I just keep telling myself that both of us getting a solid 8 hours of uninterrupted sleep that night was an equal trade off, health-wise. Friday night, however, we also needed to sleep because we were going to JDRF Type One Nation Summit Event an hour(ish) from home and were supposed to be up at 6am. We all went to bed around 10:30 pm on Friday and her levels were around 130. I crossed my fingers that she would hold steady there and things would be great. 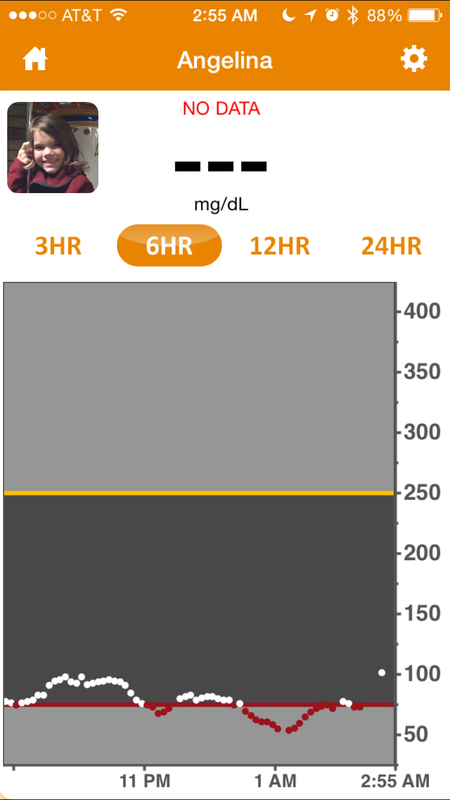 However, just before midnight I was awakened to the Dexcom alarming that she was 61 with a straight down arrow. Disoriented, I thought for a minute that maybe she was just laying on the sensor and it was a false low. But, knowing how every other night this week had gone, I dragged myself out of bed to go check on her anyway. (Please note the heavy martyr tone here.) Her blood sugar was actually 71, so… accurate for the Dexcom. Of course, the trend arrow was of greater importance because 72 alone isn’t that alarming, but a fast drop along with a 71 means “Get some sugar in this kid STAT!” So out came the Elmo juice, which is the only juice that she will drink. And is also the only juice that I have never had spit on me while she is sleeping. I also punched in a 50% reduced basal for two hours as that seemed to be what worked earlier in the week to keep her from going too low, but also not going super high during the rest of the night. She dropped down a little further before the Dexcom showed her coming back up so I thought maybe I could get back to sleep in a record 30 minutes. But diabetes had other ideas. She hit 81. And then 76. 73. 70. Dammit! It was now 1am. I’d gotten about 45 minutes of sleep so far that night because even though I went to bed at 10:30 I have trouble falling asleep and that was the earliest I had been to bed all week. And it wasn’t looking like I was getting back to sleep anytime soon. 1:30am. 2:00am. Tick tock. Tick tock. I posted some incredibly rambling, slightly incoherent status updates and comments on Facebook. I put it out into the universe that being a d-parent up at all hours of the night waiting for lows to come up or highs to come down and posting on facebook in the meantime was a bit like drunk texting. Finally around 2:30am she finally hit 100 and steadied out. I headed back to bed with the thought that we were not making it to the JDRF event because there was no way I was driving anywhere on roughly 3 hours of sleep. And then I forgot to turn off the 6am alarm I had set. So I got woken up at 6am anyway and couldn’t fall back asleep. This was in part due to the fact that my husband was also getting up at 6am to go to work and had also set an alarm. Except he doesn’t politely turn the alarm off when he decides he’s not getting up for another hour, he just hits the snooze every 9 minutes like a jerk. Even when his bedmate (that would be me) not so politely says “If you’re not going to get up now, please shut off the F#$%ing alarm instead of just snoozing it” He finally got up around 6:45 and got ready and left for work. At 7am I gave up and decided I was not going back to sleep and made the decision to get Angelina up and head to our event. You can imagine that neither Angelina or I were particularly cheerful or bright-eyed and bushy tailed on the way there, but I managed to get us there in one piece- and in record time, no less. And to top it off we actually got there before the first keynote speaker took the stage. We attended last year’s Hope & Health Symposium (as it was called in previous years) and the event went about as I expected. The big difference this year was Angelina. Last year she went into the kid’s room and did crafts and played with some of the other kids, even though she was one of the oldest kids in there. She checked out all the vendor exhibits and regalled everyone with her knowledge and was just generally engaged in everything and not afraid to speak up and speak out and share her limited experience and stories. To the point that one of the speakers, Joe Solowiejczyk, sought me out in the ballroom and said something to the effect of “I just had a great talk with Angelina. I was very impressed with her.” and had me going “Who the heck is this guy and why was he talking to my 10 yr old?” LOL. Of course, I found out quickly who he was and left the event that day a huge fan of him and his work with teens/youth/families with teens with diabetes. This year, however, beyond just the expected sleepiness was a total lack of interest. She had recently expressed to me that she did not want to go and if she had to go that her plan was to find a quiet corner and play on her phone the whole time because she wanted nothing to do with diabetes, or other kids with diabetes. (This lack of willingness to engage or co-mingle simply because it has to do with diabetes has also been her biggest reason that she had refused to go to diabetes camp this summer, much to my disappointment. She’s still taking care of diabetes tasks, but she doesn’t want diabetes to ever be the focus of conversations with others.) This year’s event added in a Tween/Teen room in addition to the kid’s room, but she said she would not go in there. Until she wasn’t given a choice because they wouldn’t allow her into the kid’s room. So instead she found a corner in the tween room. I checked on her a few times during the day in between what I was doing and she held true to her word to not engage. Until her phone died. Constant use of an iPhone for a few hours, listening to streaming music and interacting on an internet forum will kill the battery in roughly 4 hours, just in case you were wondering. When I got her for lunch she said to me “I’ve only got 19% battery left. Can we go soon?” To which I responded, “The event is over at 3. I told you to conserve your battery or this would happen.” I know, I’m a mean mom, right? We recently started using the Dexcom share, so when I got a “no data” notification on my phone from the Follow app I knew the inevitable had happened – her phone died. And with 2 hours to go until the end of the conference. I expected her to come find me and beg to leave. So I was pleasantly surprised when that didn’t happen. Around 1:45pm I decided to go peek my head into the tween room to see what was going on. 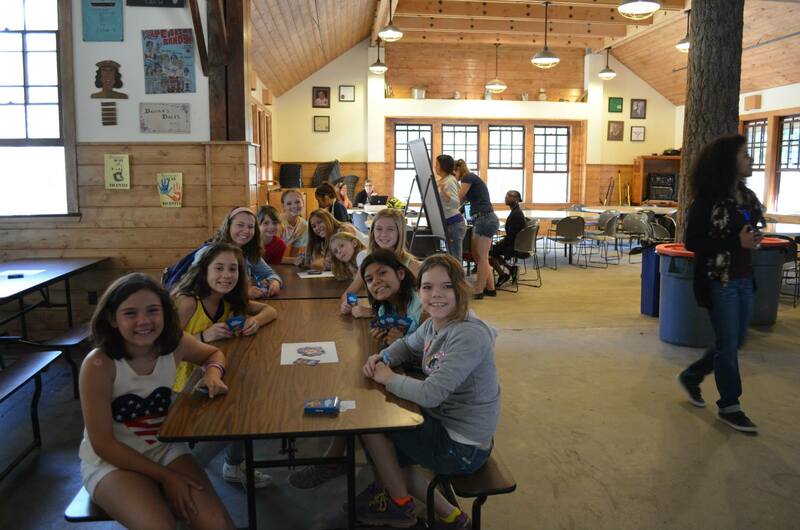 All the kids were gathered in a circle and sharing stories and experiences. I didn’t want to interrupt so I politely went back out even though I didn’t see Angelina anywhere. I was a little concerned, but figured she was fine. About 15 minutes later though I needed to use the restroom during the session I was in so sneaked out and decided to poke my head into the tween room just to check again. I still couldn’t see her anywhere but I heard her speaking, and even better she sounded happy and engaged to I left as quickly as I could so hopefully she wouldn’t see me and think I was spying. After my session was over I decided that we would leave a bit early because I wanted to beat the traffic and the last presentation was not something I was interested in. But, the tweens/teens were still having their discussion and one of the group facilitators was standing outside guarding the door. We talked for quite a few minutes and she told me that Angelina was very actively participating in their sharing session and had given some really insightful and meaningful responses and seemed to finally find her spot in the group. Of course, story of her life that she finally finds her place just as things are breaking down and everyone’s going home. But she walked out of that room with a smile on her face and happy and one of the first things she said was “I think I do want to go to diabetes camp this summer after all.” Oh, happy day! Moments like that are so precious to me these days because they seem to happen less and less often. I know some of that is just this age and stage of development, but it’s other things too with her. And I cling to these conversations like rays of sunshine on cloudy days. And then I cry while I blog about them because I realize that I miss my daughter. I miss the bright, happy, enthusiastic little girl that she used to be. And I know things have not been good for her for a while, but when I see these bright spots it makes me realize how very dark the clouds have gotten over her life (and by extension, our life). And I know that I can try to help her, but until she makes up her mind to help herself that things will not get better. I hope that she learns this lesson sooner in life than I did.